This salad is a hit when taken to a church dinner. I typically make it in a 9 x 13 glass baking dish for easier serving. 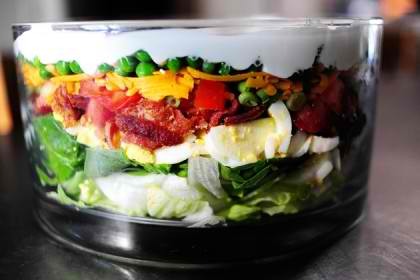 In a clear 9 x 13" baking dish or large bowl, layer salad ingredients in the order they appear above, concentrating ingredients around the perimeter of the bowl and filling in the center with lettuce, if needed. End with the layer of frozen peas. Cover and refrigerate for 8 hours or overnight. Serve with a large serving spoon, or toss just before serving.